The Kilty style is a timeless classic that is just right for any occasion. The reason these handmade women's moccasins are one our most popular is the sleek design. These suede leather Kiltys are fashionable and practical as well as being extremely comfortable. Slip your feet into these soft suede leather moccs with a flexible sole for all day comfort. 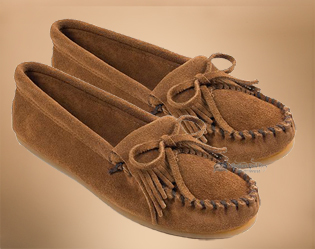 These moccasins will match any look in your closet and you will feel great wearing them.